Aircraft grade durability and stable progression. Aircraft grade aluminium frames offer a superior class of durability and stable roller skiing progression on Marwes legendary rubber wheels. Since 1986 these skis are Finnish built classics. They and will keep you on track from the first kick of your training or competition session right up until crossing the finishing line. The 590A is the perfect companion to start roller skiing in the classic sense. The lightweight and agile construction of this roller ski model is ideal also for junior classical-style skiers. The ski has an ratchet wheel in the front part of the ski. The ski is fair-priced, high quality classical style roller ski with light and stiff aircraft grade aluminium frames. 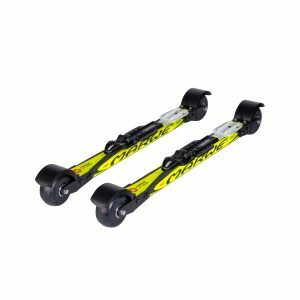 The skis rugged frame construction offers important characteristics for classical style roller skiing, the skis are light and stiff but still offer Snowfeel characteristics. 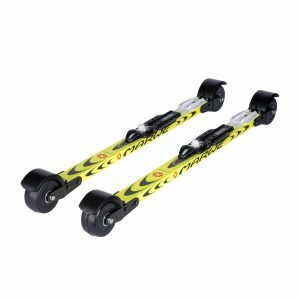 Thanks to the durable construction, these skis are popular among strong and heavy roller skiing athletes, the skis front wheels have ratchet bearings, which enable traditional style kick-back motion. Due to the lightweight aircraft grade aluminium frame, steering the skis is very easy.